One Whole Day Tours in Bali are the best tour itinerary in Bali, with something for pretty much any type of visitor. 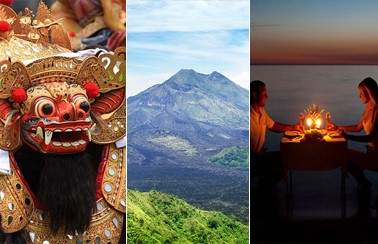 Exciting excursions and unique sightseeing opportunities are plentiful on Bali. Duration of the tour around 13 - 14 hours are suitable for those who have only limited time holiday in Bali. Visit to most famous tourist sight, from beautiful long white sandy beaches, amazing dance performance, spectacular rice fields views, historical temples, beautiful waterfalls, and the cool mountainous area are some of the attractive points of Bali. 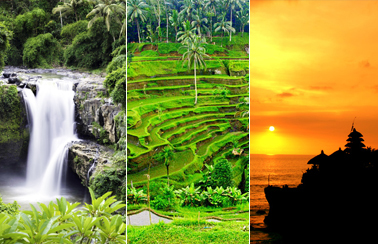 A One Whole Day Tours in Bali through the top sights of Bali will be an experience worth cherishing a lifetime. 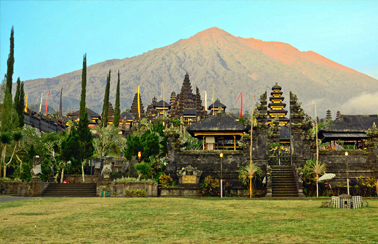 The mystic aura surrounding this charming land comes from the many Hindu temples located in Bali. The most popular atractions and places like; Barong dance, kecak dance Ubud art villages, Kintamani volcano, Tegenungan waterfall, Tegalalang rice terraces, Goa Gajah Temple, Taman Ayun Temple, and Tanah Lot Temple which always covered in the itinerary. This Bali tour package are compiled in such programs offered to you to give the wide opportunity and impressive experience. Expert and knowledgeable guide will make sure your trip will memorable one which you’ve always dreaming. The benefits like; lunch, dinner, entrance fees and tickets, insurance, and convenience private a/c vehicle will be included on this One Whole Day Tours in Bali.